Freewheelin’ Bob Dylan, released on May 27, 1963, would have been one of the all-time great debut albums if Dylan only hadn’t released the self-titled album a year earlier. Featuring thirteen songs, eleven that he wrote, it was the inverse of Bob Dylan, which contained only two originals. While his actual debut finds him still trying to find his performing voice – singing a variety of the songs in styles that he has borrowed from other recordings or from other performers – Freewheelin’ is an extremely accomplished piece of work for a twenty-two year old. The album reached number 22 in the US, and produced one single (Blowin’ In the Wind), but it also featured a number of his best songs (and I hope to write about each this week). Apparently, the album was almost much worse than it ended up being. Dylan’s biographers agree that on May 12, 1963, two weeks and a day before the album was to be released, Dylan was scheduled to appear on The Ed Sullivan Show. When Dylan told the producers that he would be singing Talkin’ John Birch Paranoid Blues, he was asked to perform something else. Talkin’ John Birch is an anti-anti-communist song (and only a mildly funny one, at least to today’s ears) and it is possible that the censors thought anti-anti-communist was the same as pro-communist. Anyway, Dylan refused to play another number, and he didn’t appear at all. Our loss. The C in CBS, of course, stands for Columbia, which was Dylan’s label. Biographers differ on the exact chain of events, but Freewheelin’ was definitely the subject of a last minute shake-up. Whether he was ordered to change them or not, the fact is that four songs disappeared from Freewheelin’ and were replaced. To my mind, this improved the album considerably. Gone were John Birch; Let Me Die in My Footsteps; Rambling Gambling Wille; and Rocks and Gravel. Dylan played all of these many times in 1962 and into 1963, and the first three are on the Witmark Demos. None of them is very good. Rambling Gambling Willie may actually be bad. The best of them is Let Me Die in My Footsteps, another early death song that would have fit better on Bob Dylan. The four songs that were added were Girl from the North Country, Masters of War, Talkin’ World War III Blues, and Bob Dylan’s Dream. The first two of these are among the best songs that he did, and Girl would be a top contender for absolutely the best thing he ever wrote. The other two are no better – and no worse – than the songs that he replaced. Still, this was a significant upgrade. 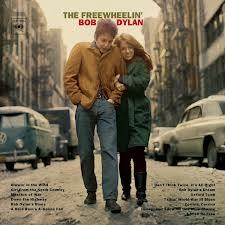 Freewheelin’ is by no means a perfect album. Of the final two songs Honey Just Allow Me One More Chance is a dud (he played it live only three times in his career according to the excellent index at BobDylan.com) and I Shall Be Free is even worse. It’s a disappointing ending to an album that opens with the a great trio – Blowin’ in the Wind, Girl from the North Country, and Masters of War. On CD (or MP3) the album has another nice run in the middle with A Hard Rain’s A-Gonna Fall, Don’t Think Twice, It’s Alright, Bob Dylan’s Dream and Oxford Town, although these were split onto two sides on vinyl. CBS recalled all of the copies of the album with the original sequence of songs, though, of course, some still exist. It is reported that they are among the most valuable albums in the world on the collector market. I checked: mine is just the regular one. Alas. I dunno. “Honey Just Allow Me One More Chance” is light, but loopy; I’ve always kind of liked it. “I Shall Be Free,” though, that one you’re right about. It just sort of lays there. BTW, is it not more accurate to say that Dylan updated/adapted “Girl from the North Country,” as opposed to writing it from scratch? Or… is that NOT the case? Notably, Harper does describe “Girl” as Dylan’s; it’s “his,” Harper says. Huh. I had thought otherwise.